James M. Archer Jr. promised to get each of his six children through their college of choice—with one exception. “He said, ‘I’ll somehow find a way to get you through school anywhere in the country you want to go, even VMI, but if any of you ever go to the University of Virginia, you’re on your own,’” recalled the 1942 Virginia Tech graduate’s son, Jim Archer ’72. Jim Archer’s brother Bob Archer confirmed their father’s sentiment, noting that while their father didn’t really steer his children toward a particular university, his passion for Virginia Tech laid the foundation for the family’s affinity. James Archer also laid the foundation for what would become the family business. In 1959, he moved the family from eastern Tennessee to Salem, Virginia, to become part-owner of Blue Ridge Beverage Co. By 1962, he and wife, Regine, had become the sole owners of the distribution company, which employed about 10 people and delivered beer in nine counties. 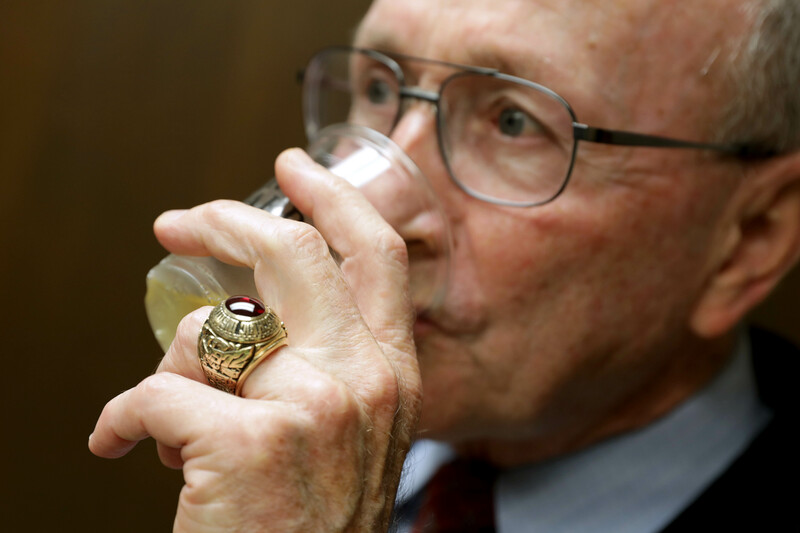 Jim Archer proudly sports his Class of 1972 ring alongside a Virginia Tech tie. 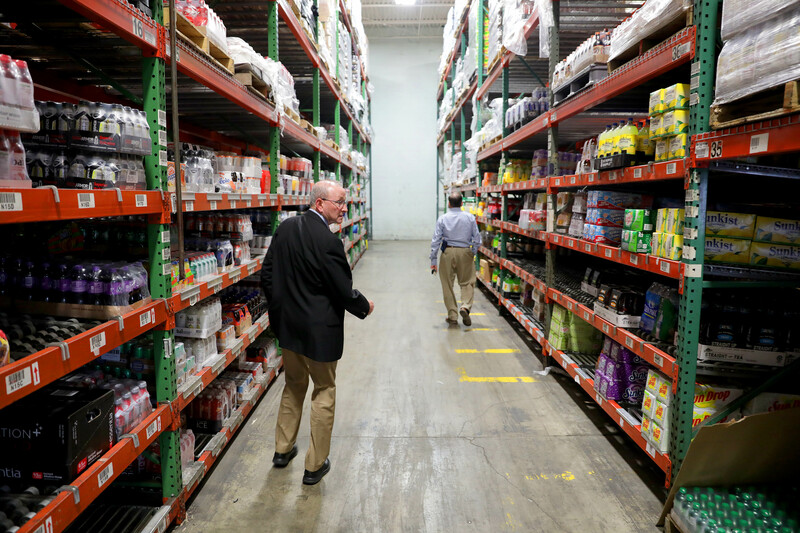 Today, Blue Ridge Beverage employs close to 475 people across five facilities, from which they distribute a wide variety of beer, wine, and soft drink products throughout a 49-county, 17-city footprint in Central and Southwest Virginia. Each year, the company sells more than 8 million cases of beverages to restaurants, grocery markets, and convenience stores, including about 100 brands of craft beer. For close to 60 years, Blue Ridge Beverage has been under the leadership of the Archer family. The company has employed all six of the Archers’ children, as well multiple grandchildren and hundreds of other people in the region. It’s been a journey of growth built on James Archer’s foundation, enhanced by his children’s educations and further enriched by the work of countless others. A resident of Saltville, Virginia, James Archer graduated from Virginia Tech in 1942. He entered the U.S. Army and was shipped to Europe during World War II. When he returned, it was with his bride, Regine, a Jewish native of Belgium and a survivor of the Nazi occupation. Years later, the couple’s children would learn of their mother’s journey during the war; her attempted evacuation at Dunkirk, France; and her survival attributed to an assumed identity and shelter in a Catholic boarding school in Wavre, Belgium. The family’s early years were spent in Johnson City, Tennessee, where James Archer worked for Tri-Cities Beverage Co. as general manager. In 1958, he learned about the opportunity to purchase Blue Ridge Beverage Company, then the smallest of five beverage distributors in Roanoke. 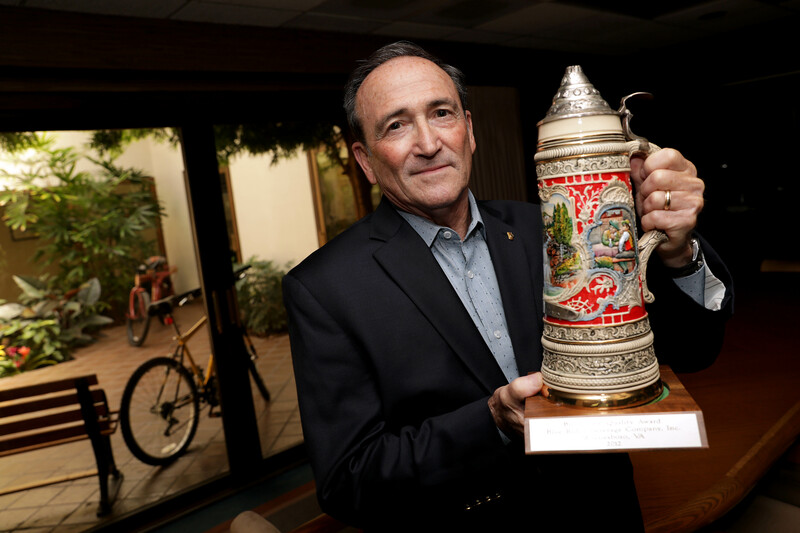 Bob Archer hoists one of the numerous awards and honors the company has won. According to Jim Archer, although the family’s early years were lean, he clearly remembered his parents’ philanthropy. “Even though our business was small, and dad and mom had a lot of mouths to feed, I know dad found a way to send a little money to Virginia Tech every year,” he said. When the time came for the children to select colleges,three of the six decided on their father’s alma mater, including Bob Archer and Jim Archer, both of whom joined the Corps of Cadets and were selected to join the German Club. The brothers both entered the Army upon graduation. Bob Archer returned to Salem after serving with the Army’s 82nd Airborne Division and a tour in Vietnam. When James Archer passed away in 1972, Bob and his mother assumed leadership roles within of the family business. At the forefront of these loyal breweries was Miller Brewing Co., whose successful introduction of a mainstream light beer in 1970s and 1980s aided the growth of Blue Ridge Beverage. Today, the Archers’ company represents about 200 different beverage companies, spanning beer, wine, and soft drinks out of their locations in Abingdon, South Boston, Lynchburg, Waynesboro, and Salem. At 93 years old, Regine Archer now serves as chairman emeritus. Daughter Jackie Archer is president and COO; daughter Nancy Doucette works as an inventory specialist in Salem; son Paul Archer is a company vice president in Waynesboro; and daughter Evelyn Hunt ’75 is the South Boston Division general manager. In 2008, Jim Archer retired with the rank of major general from the Army Reserve and last year as executive vice president and COO after 34 years with the family company. Bob Archer said the boom of craft beer has produced more change in the past 10 years than the previous decades of the industry combined. For Blue Ridge Beverage, that has resulted in changes to warehouse storage to accommodate the variety of beers in demand, as well as the addition of refrigeration, which many craft beers require. Blue Ridge Beverage has been a part of the Archer family since 1959. 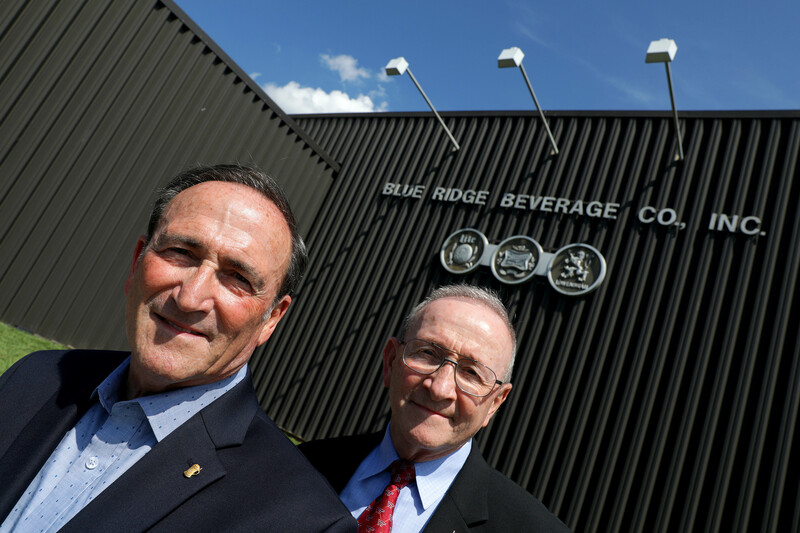 As Blue Ridge Beverage continues to grow, Bob and Jim Archer say they often reflect on how Virginia Tech and their experiences in the Corps of Cadets influenced their successes. “The whole concept of Ut Prosim, the idea of ethical leadership, that foundation came from Virginia Tech and our parents,” Jim Archer said. The university’s effect on their business continues today. In July, the Virginia Tech Carilion School of Medicine became the university’s ninth college. “Now you’ve got young doctors and teachers moving to this area … and that impacts our business,” Bob Archer said. Over the years, family members have done their part to ensure that Virginia Tech’s positive impact on individuals, the region, and the world continue. Along with annual giving for various athletic programs, the family funds the Virginia Tech Corps of Cadets Archer Family Endowment to assist with ongoing capital building projects for the corps. Until needed, the funds are used for Corps of Cadets scholarships. Such support from the Archers and others plays a critical part in the university’s capacity to mold Hokies into service-oriented citizens.